Home / Specialty Entertainment / Circus and Aerial Acts / EDWARD DE BOZO – a clown not just for kids. A businessman in a grey suit walks into the room. He has glasses and a hat. He could be any one of the well dressed people at the function, but there’s something odd about him….maybe it’s his walk, his spotted tie….or maybe because he just regurgitated a rubber CRAYFISH! And now he’s balancing a table on his CHIN! Edward De Bozo is a cheeky but lovable fool who has been seen at hundreds of functions. He has also been known to MC comedy gigs but mostly he works as a roaming entertainer, an ice-breaker for those functions where things are just a little too cool. So what else does he do? 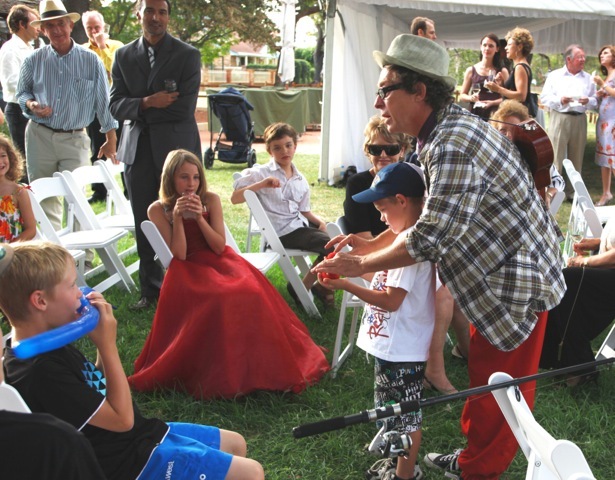 Close up magic, juggling, balloon sculpture, unicycle and fire swallowing. He also plays ukulele while singing bizarre love songs. He can write songs to fit the occasion, or tailor his act to suit a client’s requirements. De Bozo can create gentle havoc, but always in a way that keeps everyone happy. Sometimes it’s a card trick…sometimes you’ll find him inadvertently sitting in the boss’s chair. If you haven’t seen Edward DeBozo in action, you’ve missed seeing a master clown at work!